Calling all California Special/Bassa Owners! Re: Calling all California Special/Bassa Owners! 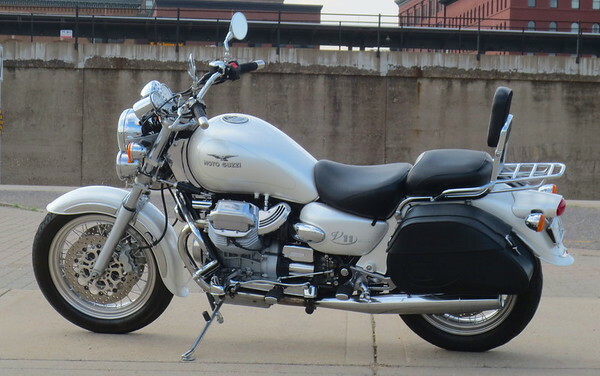 Yes, I've been monitoring ebay, cycletrader as well as this forum.....I'm really taken with the pearl white models.... a good color for our hot Texas summers too. Thanks for the continued collective interest on this forum regarding my search. 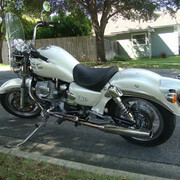 BRITMAN....is this the same Bassa I see now on Cycletrader.com for sale that you purchased from Winchester recently??? Looks to be the same bike. Whazzup??? There is one one ebay in your color. I don't have a photo sharing thing yet so no photos. 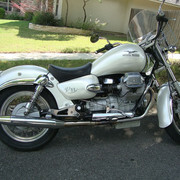 But I am a new owner of a 1999 pearl white Bassa. Just got it off Craigslist from a guy in Winchester. Also saw I guy riding a similar California in downtown Baltimore today. Black with slick hard bags including a bag guard. Nice looking bike. Don't know if he is on this forum. 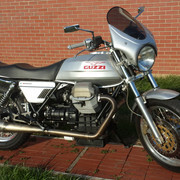 I now on my 3rd Bassa.. want to buy Guzzi Sport windscreen and Jackal/Stone bars.. anyone? since this pic it now has HB bags. Congrats! Pearl Bassas are my fave too! I am new to the Bassa machine and am not that familiar with the different windscreens available. Could you post a pic of the Sport windscreen you are looking for?? I intend to keep the windscreen that is currently on my Bassa (as shown in the photos above), however, I have another windscreen and mounting brackets for the Bassa (which were included in the purchase)....I don't have a pic of what I have right at this moment. If you can't provide me with a pic of what you're looking for, I'll try to post a pic of mine. Chet, Show them the pic of what a chic magnet the brown one is. Marc, this is the Sport screen..
Great thread with awesome pictures. 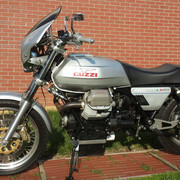 Love the 99-00 Bassa's, my 2000 blue/silver was my all time favorite Moto Guzzi. It was fun reading my old posts under Chicago Mark from 2008. They had adjustable forks and even a drain plug on the bottom of each fork leg to make fork oil changes a breeze. The 99-00 also had tubeless wire wheels. The Bassa, IMHO, still has the WOW factor in the looks department. The fenders made sense with the side covers and the tail light. 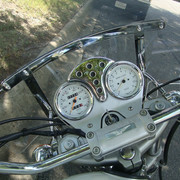 The bike just flowed well except for the side cover chrome piece not reaching far enough towards the intake. Even the Swiss made leather bags looked like they belonged on the Bassa instead of being an after thought item. As did the Classic and Sport windshields. Piaggio could put the 1400 motor with the 6 speed in it, go back to those good forks and tubeless wheels and call it Bassa II. Offer them in black, blue/silver and pearl white just like the original. and yes, keep the Bassa style tank instead of using the one from the current 1400 lineup. A Bassa II would be an easy redesign and IMHO, they'd sell in North America and beyond. This is my 2003 Aluminum Special Sport with a few changes. Tried to keep it close to stock by using parts from 17 different Moto Guzzi bikes. What is the difference between these and the EV? So, the trim and all the mechanicals, etc. are the same? The early EV's used an older large ECM under the seat. The Bassa (99-00) used an updated and smaller ECM under a side cover. Likely one of the reasons the EV seat looked so big and the Bassa (Italian for Low) was sleeker looking with the smaller seat. But yes, for the most part, the mechanical structure Frame/Engine/Drivetrain between the EV and the Bassa plus the CA Special Sport are the same. The later EV's also used the much more aesthetically pleasing Bassa rear fender and tail light. Though I don't recall if the EV retained the original odd looking chrome panels between the rear fender and the side covers. I think the EV also retained the smaller triangular side covers throughout its production run. The original EV tail light was quite an odd looking piece and to many, its looks were enhanced with the Bassa rear fender and taillight. .
After the 2000 Bassa model, the subsequent CA Special Sport model lost the tubeless wheels and the adjustable forks. Making them, for many, a cost cutting exercise from Piaggio. Similar to the no frills Jackal. I had a 99 black Bassa and a 2000 blue/silver one. On both of them I swapped the Bassa footpeg subframe assemblies with an EV rider who preferred footpegs over boards. 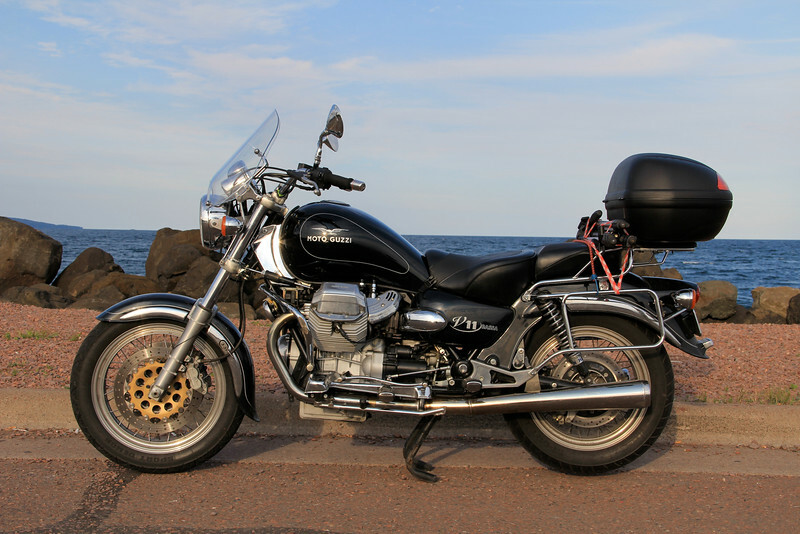 They also had the Bassa saddlebags with the Guzzi rear seat backrest luggage rack. One thing that made them comfortable for me was to replace the Bassa beach bars with a set of the V10 Centauro bars and risers. I think I had all three of the Bassa windshields as well. They had a Classic one, a Sport one and the one called the California Touring windshield. 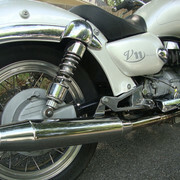 Both of my Bassa's also had Mistral mufflers with an aftermarket Italian made K&N style air filter. One of the trim pieces offered by Agostini were chrome throttle body covers that perfectly blended the chrome horn on the Bassa side cover with the intake track to the head. The Guzzi accessory throttle body covers never aesthetically flowed right and looked more like an after thought. Like I posted earlier, Piaggio could easily come out with the Bassa II by retaining all the goodies from the original Bassa but using the 1400 engine and drivetrain. Stretching the ergonomics a bit to make two up riding roomier would also be a huge plus. 98EV's got a stripped down version in 99, same wheels, different rear fender. Bassa and EV are same running gear, Special Sports were next then evolved into the Aluminum & Titanium. There is a White 01 in the Club Classified now. Seems like Shelby isn't riding much. Should be a nice one. And I might add this looks even better in person than in pics, and it looks pretty darn good in pics! John, your bike is very well executed. John, your bike is very well executed. The "secret sauce" is, they are all Tonti Frames under the sheet metal and plastic. A design that was copied by many manufactures into the future. Designed for racing. After buying my first Guzzi in boxes, a 79 SP, rebuilding and riding for many miles, I was ready for something modern but with old school looks. Knowing that the Tonti frame was very similar through out its life cycle, I began to looked at many models to see what tank and side covers would match. The rear fender is a trimmed Stone/Metal. Grab bar and side covers are 850T, Tail light many models, Seat and Tank Lemans 4. Bassa/Sport 1100 front fork upper tubes with compression and rebound adjustment, Brake and clutch levers Sport 1100/Centauro, Foot pegs, Stone/Metal, Windscreen is a GIVI replica of the Titanium. I threw in a Magni swing arm, Ram Clutch, removed lower frame rails, relocated foot pegs to the passenger peg location and made a new shift and brake lever, Aluminum tubeless rims and a lot of other changes. 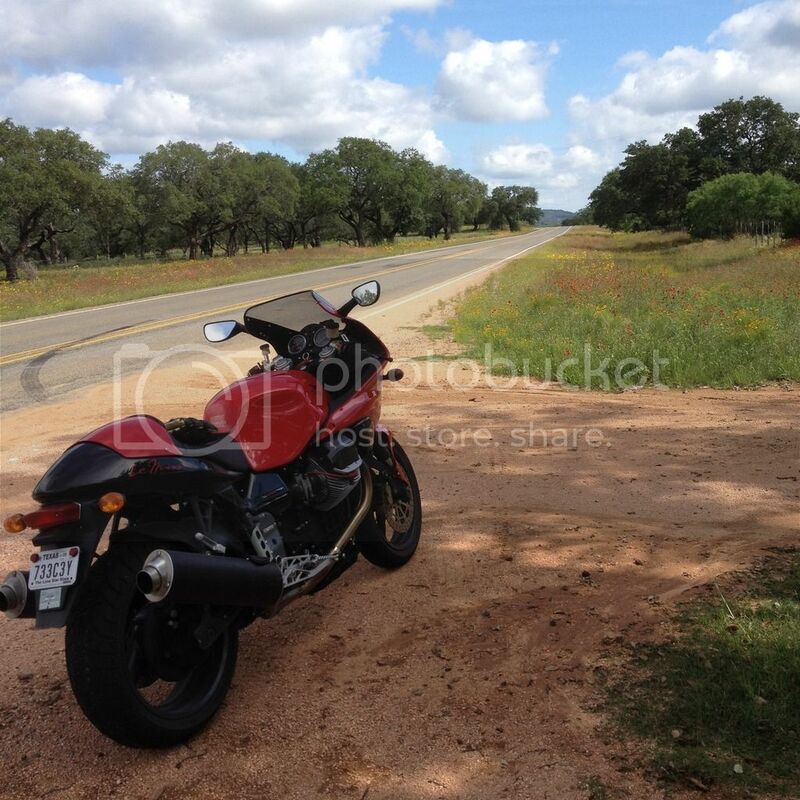 The bike runs great, rides great. I have another engine that I am waiting on the heads to be twin plugged and a set of high compression pistons to install. 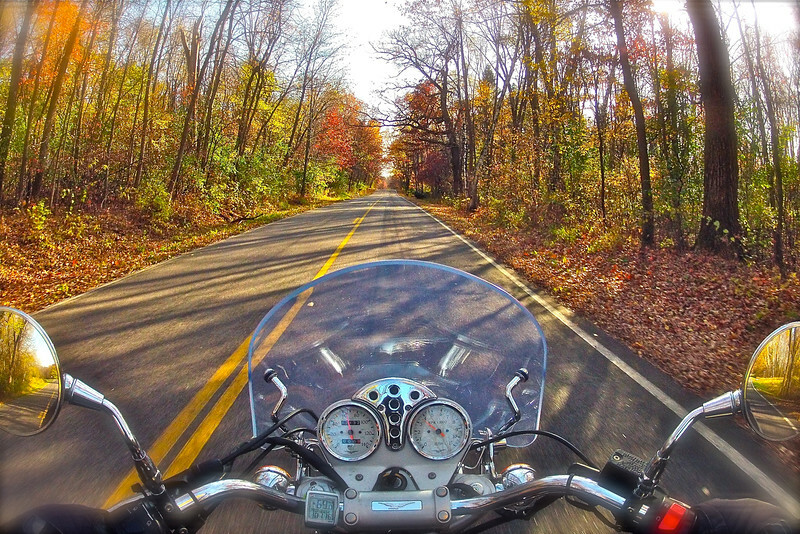 I had installed the high compression pistons last year and rode it a few miles. I could not get the detonation tuned out at wide open throttle. It ran great, but sounded like two metal spoon being tapped together at wide open throttle. Before I shimmed the base of the cylinders, it was showing 225 psi cranking pressure. I shimmed the base and got it down to 190. Pete Roper said I was going to blow the heads off. That would be interesting to see, from a distance. It's a toy and something to keep me occupied in the long cold winter.